I love staying in Paris in summer because it’s so different from the rest of the year. In one of the my very early posts back in October, I talked about all the things I dislike in winter, so I thought I should tell you what I like in summer. First, there are fewer Parisians because of the GREAT EXODUS. The period most people prefer to go away is between mid July and mid August because that’s when you’re likely to have to best weather at the French seaside or in the country. People who leave around 14th July or come back after 15th August also gain a day because they’re both public holidays. There’s a saying too that the weather goes downhill after mid August. Second, I love being able to go out without a coat or hat or gloves, just putting on sandals, grabbing my bag and iPhone and walking out the door. I feel so much lighter! And if the temperature isn’t as warm as I’d like it to be, I can put on a light jacket and keep it on. I don’t have to keep taking off clothes when I walk into a shop or café. And I usually take an ultra-light Samsonite umbrella just in case. It’s Paris, after all. Then, I can sit outside to eat. My very favourite place in summer is Café Diane in the Tuileries Gardens. The view is the one you can see in my header photo this month. Now isn’t that something? You can stay as long as you like and it’s a pleasant walk there and back. I always feel as though I’m on holidays when I go there. And the sunset over the Louvre is quite spectacular. We can go for after-dinner strolls, wandering through the Louvre and across the Pont des Arts and have a glass of wine somewhere or maybe call in to say hello to Louise at Café Louise. If we’re feeling really energetic we can go down to Ile Saint Louis and have Bertillon ice-cream. Otherwise, we can go and get a real Italian gelato from rue Montorgueil and eat it in front of Saint Eustache. During the weekend, there are lots of places to cycle –along the Marne if we don’t have a lot of time or feel like stopping off for dinner at the Pergola, out to Rambouillet forest or to Monet’s garden in Giverny. We just have to put our bikes on the trailer on the back of the car. Sometimes we cycle in Paris itself, along the quays which are car-free on a Sunday, but I prefer to walk the streets of Paris rather than brave the traffic. Though when the famous Paris-Plage is in full swing from mid-July to mid-August, it’s much more difficult to cycle! I can open the windows of my office during the day and hear the fountain playing below and people’s voices. I don’t feel so cut off from the rest of the world. The gardens are open until 11 pm so we can go down and sit around the fountain when it’s really hot – believe or not, that can happen sometimes! The only thing I miss are barbecues but now that we have the house in Blois, I don’t feel so deprived! 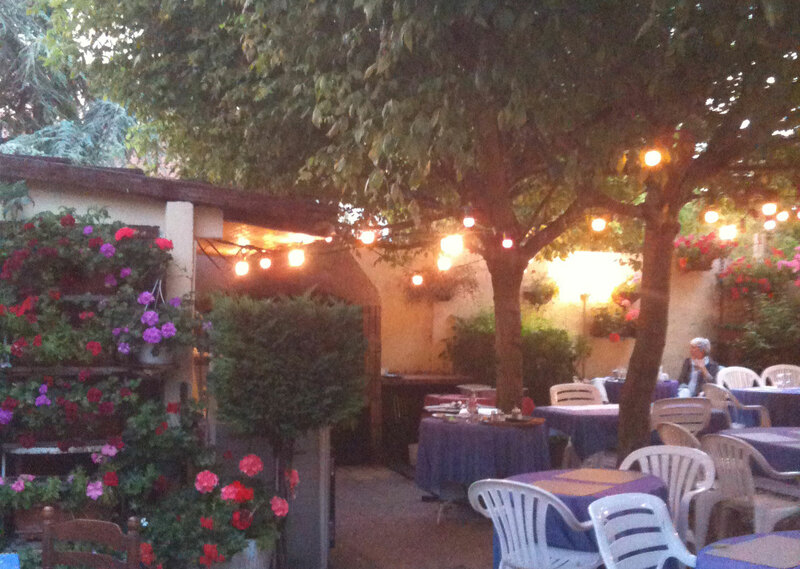 This entry was posted in Paris and tagged La Pergola Gournay sur Marne, summer in Paris. Bookmark the permalink. I love that first picture. I’ve never seen it framed quite like that. Thank you! You’ll have to go and have lunch at Café Diane this summer! I am having very faint reminiscences about my first time there (the early 90s…) a reasonably empty city in August and hot days being a tourist. I remember finding some swimming pools during my stay. I could use my fledgling french to ask ‘il-y-a une piscine près d’ici’? You were lucky. We’re still waiting for the “hot days” this year.